Discussion in 'Pokemon GBA Event Distributions' started by Professor Oak, Dec 26, 2016. This is the distribution cartridge used to distribute the Aurora Ticket, an item which unlocks Birth Island on Pokemon FireRed, LeafGreen and Emerald. The distribution cartridge distributes the Aurora Ticket as a mystery gift using the GBA Wireless Adaptor to another GBA with a Wireless Adaptor connected. Once the other GBA has received the Aurora Ticket the player can travel to Birth Island to catch Deoxys. This appears to be the US version of the distribution cartridge which will only distribute to FireRed and LeafGreen, not Emerald like the UK version of the cartridge does. A massive thanks to Digiex member Deoxyz for purchasing and releasing this distribution cartridge, I know he has personally spent a lot of money on this and wanted nothing in return, expect that others enjoy it all these years later. So be sure to send him the love as without him it you would not have this distribution cartridge. Note: Other language Pokemon games might work, this has currently not been tested. gatekeeper1122, fabio00, King Impoleon and 4 others like this. Ah well, too bad I wouldn't get two wireless adapters just for this. Still pretty cool to have though and it would work on emulators so I'm not too bothered. So now we have MYSTRY Mew saves freely available, we can get Celebi and Jirachi easily with the bonus disks, and we can get Deoxys through Auroraticket from this, and then Lugia/Ho-Oh from the 10ANNIV one for those who don't care for the Gamecube games. This is perfect. Celebi is still troublesome since it requires a Japanese GameCube and Japanese Colosseum+savedata, but I'm assuming there's some easy work around for this that I don't know about. Personally, the cart/rom I have my hopes up for the most is Aura Mew, because unlike others, I know it's at least in some people's possession. We'll see what happens. Again, thanks for the great ROM backup, Deoxyz! Since we're dealing with roms, we can deal with emulators, and there is a thread here with a link for the Japanese bonus disk + a completed save file of Japanese Colosseum ready to be used for Celebi, though I've never personally been able to get the link between Dolphin and VBA to work, it just starts lagging immensely on the GBA side as it connects, but I think that was just my version of VBA because the same thing happens when I try to emulate any kind of link activity even between 2 GBA, lol. Otherwise any hacked Wii or Gamecube should be able to run the bonus disk iso regardless of region so I don't think it's that much of an issue, though I do wish we could just have an English one to get an English Celebi (10 ANIV being the only one ), rather than relying on a Japanese event. Probably easier to use the AR code for Colosseum that starts the unreleased English Celebi distribution, but I don't know if I'd consider it entirely legit since well, it was never released. But it's still more legit than any random hack imo. Yeah, I had tried to get the VBA + Dolphin link working last year for Pokemon Box, but couldn't get it to work either. Of course since we're using emulators, we can also just simply transfer an Ageto Celebi .pkm/.pk3, but with the distro roms and Mystery Mew savefile, it's still the direct "legit" transfer method and is very easy to use them with real hardware. Not so much with Ageto Celebi. I suppose Wishmkr Jirachi is in the same boat, but the US Bonus Discs are very easy to obtain. Right though, a hacked Wii should get the job done easily enough, though I'd say it's still not as simple as just using a GBA flashcart. Best case scenario, we find one of the so far unseen holy grail distro carts, a US 10 ANIV cart that has the 10 ANIV Celebi. Like I said, best case scenario... it's highly unlikely to happen any time soon, or at all. King Impoleon and UnknownRespected like this. Indeed i was thinking that, if someone happened to own a little shop they could have a GameCube in the back and have it distributing the event for people all year around. You'd probably never get that many people playing such an old Pokemon game locally though unless you ran some sort of gaming event. HaxAras, UnknownRespected and Deoxyz like this. Hm, nice idea. There's a local video game store where I live, which buys and sells anything used/new from current generation all the way back to Atari and before. They have a few generic kiosks that have random systems for anyone to use. They're always buying and selling Pokemon games, so they may possibly be interested in a setup like this for the Aurora Ticket. I may bring up the idea next time I happen to stop by and if the owner is working that day. HaxAras, UnknownRespected and InsaneNutter like this. That reminds me of this one time a friend and I tried to host something like this at school years ago. We knew that a bunch of people there had DSes and played Pokémon, and we had modified distro roms for every Toys'R'Us and Gamestop events. There was a room in school where we used to hang out during breaks and play games on handhelds, and the last day of school before Christmas break was usually a free day where we could do whatever we want so we figured there would be a bunch of people there who may be interested. We talked with the guy who was in charge of the place and he thought it sounded like a pretty cool idea, we made a sign that advertised it and placed it at the entrance so that people coming in could know. In the end, we never got anyone. We hadn't really hung out there in a year or two so I guess it's possible that everyone there who played Pokémon at the time either stopped, or just didn't care at all, heh. Kind of a shame because it would have been fun. A setup like this at a video game store would probably need to have a spare Wireless Adapter available for people to use though, since I don't think very many people even have Wireless Adapters. But if the store deals with used games including games for a lot of older systems, there's bound to be people coming in who would see the sign advertising it and be interested in at least coming back another time for it. Indeed i guess many people probably won't have a Wireless GBA adapter, however with the DS games that could easily be done. Certainly for a small independent store its a good way to get people in and help new players out who might be playing for the first time, given its impossible to trade online using the DS now. Well it could still be done for the Aurora Ticket, just the store owners would need to keep a spare Wireless Adapter available and people can ask to use it so they can get the distribution. 10ANNIV could be distributed too, customers could come in and ask and they'd just need to pull out the distro with a link cable, and perhaps a spare GBA/SP if the person only has a DS/Lite, but it could work. Heh too bad I don't own a store like that. I'd totally do that. Seriously! I was reading this and thought it would be cool if people like us who have access to this hosts giveaways and wireless events. I have the Winter 2011 Celebi cart, Summer 2012 Keldeo and a bunch of ROM's. I doubt many people would be interested or we could just advertise online that on a certain day, people with these carts/roms will be distributing at set locations for people who still play these old games. Seems more like a fantasy or dream than a reality though. How many people would really be interested or able to show up? How many people would really be interested or able to show up? If you have a local Facebook group for Pokemon GO, that's probably where you have the best chance of people interested in Pokemon locally. In the group for the town I live in we seem to have a mix, people who have never played Pokemon on the Nintendo consoles and then people like us who have played many of the games over many years. UnknownRespected and HaxAras like this. I didn't even think of that! I could totally find a FaceBook group and do some kind of public meetup on a certain date and distribute these old DS events to people and if I get a flashcart, I could share the GBA ones. King Impoleon, UnknownRespected, Deoxyz and 1 other person like this. You know what? I've been wanting to do EXACTLY that! It's why I wanted a DS injector for Gen 3 Wonder Cards. Though now I want a way to distribute the non-US Aurora Ticket Wonder Cards through Wireless Communication, like at the original events. And hell, why not figure out how to send Wonder News wirelessly as well? Since we've known that we have the rom for the US Aurora Ticket, which distributes to only FRLG, though the UK version of the cart distributes to FRLG and Emerald, I kept wondering about the US Emerald. This is obviously because the US Aurora event was before Emerald was released, and in the UK after Emerald. Though according to Serebii(see image), there was a US Emerald Aurora Ticket distribution after all, as part of the 2005 "Pokemon Rocks America" tour, while the 2004 PRA tour had the FRLG Aurora distribution. The 2005 tour also distributed the only US Mystic Ticket, which was for FRLG and Emerald, as well as the ROCKS Metang distribution. It seems carts may tend to leak in groups, but that's just a theory of mine with little basis. We know carts have leaked for all European language 10Anniv and Aura Mew carts. You can group those into two groups, since they are just different carts used for the same two events. I'm just assuming that since we know a 2004 Rocks tour distro cart has leaked(Aurora), then others from 2005 may have a chance as well. I can't really say anything for certain about the 2005 Rocks tour, but there must be a second US Aurora cart that is made for Emerald, whether or not they are in private hands outside of Nintendo employees yet. To be honest, that just gives me more hope that a Mystic Ticket cart will surface in the future, but it'd be nice to see the Emerald Aurora and ROCKS Metang carts as well. I know the ROCKS Metang has been a point of interest for some people too. I'm willing to bet Serebii is simply wrong about this, because it states the distribution date as May 1st 2005 which not only was the release day for Emerald in North America (it would make no sense to hold an event like this for only one day and on the release day), but Rocks America 2005 was in mid-September and October. 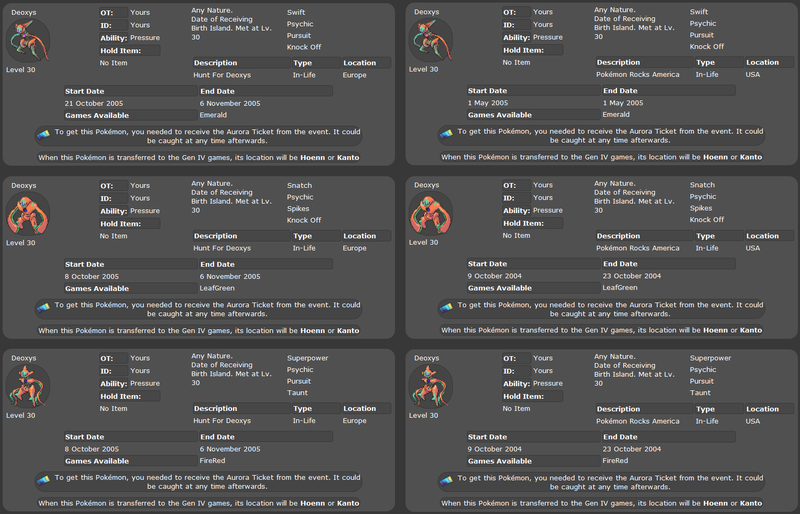 And here is an article linked from Bulbapedia, no trace of Aurora Ticket or Deoxys in there. Yeah, I know Serebii wasn't as reliable during his early days, though I don't think he'd have that up if it didn't exist, though I can easily see the dates being wrong. You're right though about the link. It mentioning the Mystic Ticket for Ho-oh and Lugia, but not the Aurora Ticket or Deoxys seems odd. Also, I worded it weird in my last post about the carts being leaked in groups, but I reworded it and that point still stands. A 2004 PRA cart being out may not mean any 2005 carts leaked, but if we do see a 2005 cart, I'd assume the other 2005 carts will possibly leak as well. Just a loose theory though. Edit: Found this, which is about the 2005 tour and mentions Deoxys, but it's worded in a vague way that I can't determine if it's meant to claim Deoxys is available that year, or just saying it has been available in past tours. At the same time, Bulbapedia/Bulbagarden is even more notorious for being wrong than Serebii, so I don't know. I'll see if I can find any definite info on a 2005 Aurora Ticket later on when I have more time. Yeah I'm pretty sure that article talks about Rocks as a whole, and not specifically the 2005 one. The last sentence makes it especially obvious to me. They're likely just giving an example of the kind of events Rocks distributes (and they don't even mention Lugia/Ho-Oh Mysticticket for the 2005 one in that article either) and not specifically saying that the 2005 one will give Deoxys.